Was it better than the original? Did we love it or hate it? Was it appropriate for a 6 year old? 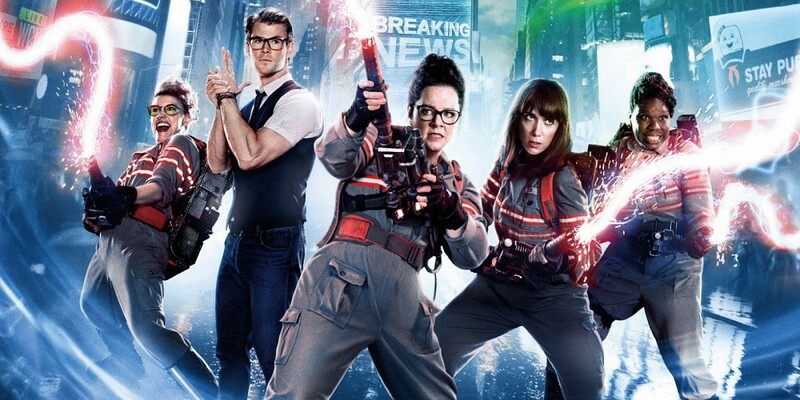 If you want the new Ghostbusters movie thoroughly Spoiled, who you gonna call? Every fortnight (ish) my beloved and I are watching a film by either Ridley or Tony Scott. We’re watching in chronological order. There are, of course, spoilers. I love the music, and the lack of music is quite stark in a number of these scenes – when they’re looking through the cabinets and the only sound is their footsteps, it really enhances the creepy-factor. And I love the graphics – the planets are gorgeous. They have such bulky space suits – they seem peculiarly un-futuristic, but then the whole aesthetic is that it looks remarkably familiar for all that it’s set a long way in the future. I really like the way the characters physically deteriorate. Ripley has a massive bruise on her cheek; Lambert is grimy and sweaty and distraught. Parker is sweating. Ash, though, continues to look calm. BECAUSE ASH IS CREEPY. The cinematography is marvellous and it’s a delight to watch. Intimate, for all it’s set on a huge spaceship. We are big fans of adventure and action films. My beloved is an unrepentant Top Gun fan, much to my dismay. We’ve both liked various Tony and Ridley Scott films over the years. So we thought, why not do a best-of viewing? That would be fun! And then I looked at IMDB and MetaCritic, and it turns out that some of the top-rated films from Tony in particular are comedies. I am not watching Get Santa, nor Cyrus. Anyway, after some to-ing and fro-ing, we’ve decided on an idiosyncratic list of five from each Scott, which we’re going to watch in chronological order. It includes some films we’ve seen before, and a couple we never have (or not recently enough to have any real memory of). We’ll be watching and reviewing every fortnight(…ish). As I mentioned in my post about the book Queen of the Desert, a biography of Gertrude Bell, I finally got around to reading the book after seeing the biopic directed by Werner Herzog and starring Nicole Kidman. I didn’t mind the film; my mother, having read the book, didn’t love it but didn’t hate it; having read the book I am increasingly annoyed by the film. We went, we watched, and now we’re going to flail our hands about it, shortly before going to buy all the Rey toys that aren’t out there. The Bechdel-Wallace Test – is this film feminist? Galactic Suburbia: Star Wars spoilerific! We went, we watched, and now we’re going to flail our hands about it, shortly before going to buy all the Rey toys that aren’t out there. You can get us from iTunes or at Galactic Suburbia. Presented largely without comment: my viewing this year. Thought I had watched more movies than that, but even with short seasons, rewatching the entirety of Spooks was a pretty epic undertaking. Also the entirety of Star Wars, and the three LOTR. In which we throw our remit out the window to talk about a year’s worth of non-SFF! This year, the Tiptree Motherboard established the Tiptree Fellowship Program to seek out and support creators who are striving to complete new works and make their voices heard. By adding Fellows each year, this program will create a network of creators who can build connections, support each other, and find opportunities for collaboration. First Tiptree Fellows: Walidah Imarisha and Elizabeth LaPensée. You can donate to encourage these and other new creators – donate through PayPal — or you can mail a check to 680 66th Street, Oakland, CA 94609. What Non-SFFH Culture Have we Consumed over the YEAR? “The emperor is not as forgiving as I am.” Way to go making them both even MORE terrifying. I still like the costume progression for Luke. The CGI band at Jabba’s is… I’m conflicted. I like the music! BUT. OMG “I’m all right pal; I’m all right” Han and Chewbacca SO CUTE. The PAIN of the beastkeeper. You made one of the supposed baddies grieve so poignantly! The whole rescue from Jabba is basically a heist plot. I love it. The imperial guard. Dead awesome. Yoda is the most compassionate and benevolent puppet ever in the history of puppets. The speed bike chase is very awesome. Han’s nobility: he apologises to Leia! The conflict within Vader is made genuinely more complex with deeper backstory. What were you thinking, George? The CGI band at Jabba’s… the animation is horrid and so unnecessary. Also unnecessary: Jabba’s treatment of women. Ugh. Lazy writing, George. It’s not like we can be under the impression that he’s a good guy. What an ignominious end for Boba. “FROM A CERTAIN POINT OF VIEW,” George? You’re making Obi-Wan a relativist? a post-modernist?? Just no. Also: Luke’s feelings for Leia “do him credit”?!? How on earth do you figure that?! Ew. James: NO, not ew, Obi-Wan is talking about Luke having brotherly feelings towards his sister! Not anything bad! Alex: whoa. That’s thirty-odd years of grossed-out-ness being turned on its head. George. Look, George. Tax collectors, George? No one liked the Trade Federation in Phantom Menace, George, and the idea that they ought to appear on the bridge in this film? No. That’s the worst retconning yet. Apparently I imagined that this was retconning! They’ve always been there and I had either not noticed (possible) or I was assuming George was being evil because prequels! Sorry George. My mistake. Ewoks: conflicted. Little bit too much like you’re going with Noble Savages. Some of the markings etc are a bit too much like stereotypes of some earth cultures. Made me queasy. I cannot adequately express, George, how annoyed I am at the retconning of the funeral. The idea that it is young Anakin who appears with Obi-Wan and Yoda is just wrong. If he has genuinely been redeemed by Luke’s actions, then his old self ought to represent that. Otherwise, you are dismissing the genuineness of his return to the side of Light. And that’s not fair. 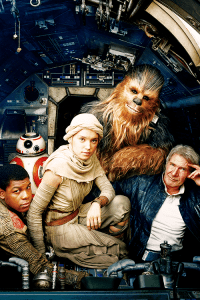 I AM SO READY for The Force Awakens. James: I’m surprised by how early in the film this occurs. James: the music makes the film. Luke says, in the middle of a FOREST, “It’s like something out of a dream!” Wow, George. Subtle. “Wars not make one great.” Preach, George. The revelation that the emperor knows who Luke is is definitely more poignant thanks to the prequels. And Yoda’s hovel is more poignant too. I’d forgotten just how echoes/foreshadowings there were in the prequels, with words and actions and scenes. It makes me forgive them a little bit more. Unconvinced by the new bits of the snow critter. THAT KISS GEORGE EW MY BRAIN. You’re continuing the assumption that cities <=> civilisation in Luke’s little comment about Dagobah, George. I know he’s still a whiny little kids, but nonetheless – unhelpful. You retconned Boba Fett’s VOICE, George. Vader goes through underlings at a rate of knots. Bad vision of leadership there. Were you sad that Mark Hamill didn’t get prettier, George?